When laying Goofer Dust,is it allowed to watch from a distance to make sure the person stepped in? I have read that whenever disposing in a ritual manner ,we are to walk away without looking back. But what about when laying Goofer Dust or Hot Foot powder;is it "allowed" to watch from a distance ? Hmmmm, I do not believe I have heard of a specific prohibition on watching but I personally would not bother to do that. It would be awfully easy for you to be seen and identified as the person who laid down the dust and it leans toward worrying over the work a bit to much. The thing is there are very few spots where I can lay this trick and I don't doubt the power of it one single second;i just need to be sure they walk over it so that I don't lay it multiple times and hurt other people (I know the name called into it should be the only target affected but Miss Aida has some stories about broken legs and arms of others than the target . No worry about being spotted. I've laid Goofer dust right in front of a jerk and he stepped right in it as he was calling me nasty names. Rather than getting mad, I stood there and took his verbal abuse because I was enjoying the fact that he was standing right in the center of the X that was enclosed in a circle. Okay, so here is an odd inquiry for ya. I am a gardener living in the Cascade Mountains. We have hella gophers here and they are terribly destructive and annoying. I mean, they have hollowed out my entire raised bed, killing all of my veggies! Grrrr! So, I had a thought. What if I goofer the gophers? I realize that goofer is serious business... but these gophers are serious enemies. They take food out of my family's mouths. They wipe out my favorite crops repeatedly. I hate them! Can I curse gophers with goofer dust or is this a ridiculous notion? I was thinking of just putting it down every gopher hole I find in my garden, hoping the result would be death/decrease of their insanely huge population on the land I work. Both Miss cat and I are avid animal lovers and do not condone killing or harming animals. I understand your frustration but I do not give out spells to harm any animal unless it is threatening my life. I would suggest that you hot foot them instead. also, you may want to look online to see what the professional rodent people do to keep them away. Oh, I see. All of the farmers I know regularly kill gophers because they hurt our livelihood. Many do so with actual poisons and physical traps. Goofer seemed comparatively less harsh but perhaps not, huh? I did not think of hot footing, but I will definitely try it. Thanks! Is it okay that I totally disagree with valuing the life of gophers, rodents who seriously damage my ability to produce healthy food on which my family depends for sustenance, over human beings of any persuasion or inclination? I am a Christian and believe that human beings are children of God, made in God's image and their souls are invaluable in the eyes of God. Goofering a human being seems pretty nasty from my perspective and I would not ever do it, under any circumstance. Also, I live in an extremely remote area and it makes a major negative difference in my life to drive two hours to purchase food with our very hard-earned money from a grocery store because gophers ruined my family's yearlong supply of veggies with which I was planning on stocking my pantry and freezer... and worked extremely hard at planting and tending. I would not think of cursing animals who were simply inconveniencing me, such as bears who dig in the trash. However, these gophers cost us and have left us seriously struggling for food at times. So, please just don't judge me for wanting the varmints dead. End rant. Thanks for reading and I hope that I am not coming off in a disrespectful way, as I consider you input extremely valuable and will indeed attempt to hot foot the gophers. Hi guys new to this forum and it's an amazing experience to have read some of these comments and teachings. It's comforting to know that we don't have to be victims and that justice is in our hands. Ok, I have some questions about Goofer dust I am wanting to send some in an envelope with a fake letter to someone who abused me both physically and mentally and who was also abusive to our sweet family cat in order to do them in but I want to make sure that it is done right. 1. Do I state the persons whole name or just their first name followed by the intent, does it even matter? 2. What do I do with the excess dust lets say I dust it over something like an open bag or even in a bag (shake and back) obviously I do not want her to notice the dust and there will be excess so do I collect what did not stick back in my bottle and then just throw away the bag away or even just throw the bag away with the remaining excess? 3. Do I intone before or after having dealt with any excess dust from the working? 4. If they touch it with their hands is it just as potent as if they had walked through it? 1. Say I want to Goofer a target using a picture and bury it to the east is one off of the printer alright or does it literally have to be actual film? 2. How effective is a printed picture (if that is alright to use) in comparison to actually having them walk through a track (which is not always an option)? 3. Is it true that the person will waste away too as the picture deteriorates even if it just buried in a back dirt alley somewhere and not a graveyard or does it have to be a graveyard? Good morning I have a quick question. I put goofer dust on someone's car. We live together. I'm wondering how that will affect my home. I stated my intentions while laying the powder but u dropped some in my yard too by accident. I think you're fine, since I'm guessing you didn't call your own name into the powders when you put them there. But if you're worried, you could wash any areas the powders landed where you don't want with a bucket of water with a capful of Chinese Wash in it. Thank you Miss Aida I did some reading on those links yesterday although I am still not understanding the method of intoning the curses (with the name of the individual) for example do I just say thier name a few times and then call out the curses I want to visit upon them while dusting a letter or laying a track and do I need to vibrate these things in anger or do I just say them as I normally talk? You're asking Spirit to curse someone, not pass you the butter. You want to use your anger when you send out your curse, which I find comes naturally in this kind of work. Summon up all of your feelings for this person when you approach your spell and you will likely find your words and tone reflect your anger. Thank you Miss Aida, do I only need to say their name if others might be exposed to the dust? Lets say I dust a letter to a scum bag animal abuser and nobody else is going to open it but him do I need to read his name before listing the curses or is just reading out the curses while dusting the letter sufficient ? Basically what I am asking is when do I include their name in the working and when do I not need bother with their name and just read out the curses that I want to place on them with the dust? I'm not Miss Aida but you're welcome. Use their name in your spell. You want your target identified and you want to channel your anger towards that one person. It would make sense to call them out by name. Where the 2 lines od the X meet, spit on it. Now, you can say anything, I just used the leg as an example. Now, I have done this in the past numerous times, and it works. I'm not clear on your directions when you said ...where the two lines od the X meet, spit on it. Did you mean of? And if so I guess the middle of the x. Can you do this spell without the target touching it? Or they must walk over this? Or can it be done to paperwork? OK I have another question that I didn't see in Hoodoo Theory and Practice and it is regarding multiple Goofer workings in one day. Why not just space it out you might ask? Well, I work with the moon and the planets and so that's a thing for me...is it necessary to wait until the Goofer has ran it's course on one person before beginning work on another. For example this Saturday the moon will be waning in the sign of Aries and I want to dust some mail for one person and bury a picture in a box for the other one in the hour of Saturn and the other in Mars...days this ample do not come along as often as I would like and It would be nice to take care of two targets that same day but I do not know if this is possible because I do not want to split any of my energies lessening any of the workings. Yes, spit in the center of the X where the two lines meet. And you want the target to step on it, so it needs to be done where they will physically walk over it. Working this spell remotely will not have the same effect. Please allow me to ask my question again but in shorter format since it seems that I may have been overlooked: can I do two goofer dust workings in one day if needed or should I only do one? I know in that LHP magick you are not supposed to do death energy work on another person until you have recieved results for the first but does that apply to goofer dust or is goofer dust like a whole different kind of beast with different rules? This is a forum on the practice of hoodoo, so we cannot comment on other spiritual traditions as referenced in your post. You could work Goofer Dust on two separate targets in the course of a day (I presume they are for unrelated purposes), however you want them to be conducted separately - two individual spells. I would advise that as you approach each one of them that you give it your full attention and focus. Looking forward to getting Miss Aida's book next month too when I get paid I will savor every page!!! Me again hope you don't mind but I wanted to share my experience with goofer dust tonight and ask one little question too. I started out in the back shed but the wind was blowing hard and coming through so I moved into another room that is attached to the side of the house but it's far away from where my room is. I worked my anger/hatred up and put a little goofer dust into a little box that I had ordered and then placed the targets picture in it calling out his name first and then what I wanted him to suffer with some visuals to go with it while putting little bits on top of his picture. I gotta admit it was pretty scary this being my first time working with the goofer but at the same time I am proud of myself for having the courage to do what had needed to be done and was so long overdue. I buried the picture about a 1/4 mile from here in a back alley probably about a half a foot deep because the ground got hard past that, it's raining right now so hopefully the rain doesn't bring it up: I packed the dirt on top tightly though with a big spoon. Oh ya, funny thing is on my way to the back alley to bury it some crazy looking guy came out of nowhere telling me this was his territory my guess is he thought I was looking for things to steal because he looked like a meth head. Anyway I just played it cool and he asked what I had in the bag (the box) and I told him that I was on my way to bury a dead mouse he believed me and went his own way. I think that working with those negative energies had surely attracted him and I hadn't purified myself yet but he wasn't too threatening so no biggie. After I got back I cleansed my hands and forearms with some sea salt water and dumped it at a crossroads without looking back. My question I guess would be this: before leaving to bury the box I had cleaned up the area with a damp paper towel and I think some of the goofer dust had gotten outside of the box because I saw some tiny little pieces laying there (that were not there before I had begun) and so I got those pieces with the towel and threw it in the outside trash in a plastic bag, was this OK to do because that is what I did? Your work sounds OK but you really do want to try and get the Goofer Dust to a place where your target will walk in it or otherwise come into physical contact with it. Please read a few posts above yours to where Miss Aida described how she uses it. That is very sound advice. Thank you Miss Athena: yes, a mess is best, lol...could you or Miss Aida possibly answer two other questions that have came up for me recently if possible? 1) My first question is if I use a cotton ball to dust a letter can I just throw it away after or does it need to go to a crossroads? 2) Also, If I need to lay a mess and I use a Styrofoam cup to do it so it looks like I am just drinking something can it just be thrown away after or does that need to go to a cross roads too? 3) What about the straw that I used to mix in the regular dirt with the goofer dust? You are overthinking your work. The fact that you worded your second question with the word "too" at the end indicates that you hoped or believed that the reply to the first query would be yes. Not so. Because while a cotton ball is biodegradable. there is altogether too much trashy littering in this world and styrofoam is non-degradable. In fact, you shouldn't even be using styrofoam at all and many towns have banned it -- but certainly do not scatter it around the Earth. As for your straw, i hope it was paper. If not, please recycle. Yes I know I can be a bit neurotic sometimes and yes I will throw them in the trash because like you I seriously hate littering and love the earth in fact I cringed even thinking about having to throw that stuff at a crossroads but honestly I wasn't sure and I would never would want to put myself in jeopardy safety safety safety and then some more safety. I actually didn't know that about Styrofoam I thought it dissolved after so many years and don't worry I haven't done either of those methods yet I just wanted to know for the future thank you for enlightening me on these things owner and admin catherineyronwode. Goofer Dust gives people hardships, crossings, gets rid of them, etc. But doesn't cause death. Miss Aida forgive me for bringing this up after so many years of your having written this and I do not mean to be disrespectful but what exactly are you talking about here considering that the very name of goofer dust means to "kill" and also that it's described everywhere that you can read about it as doing just that? Hi all!If I have someone's clothing and want to goofer dust it, will it affect them if I keep it? Sorry, no it will not affect your target unless you return the clothing to them having tricked it first. They must come in contact with the Goofer Dust for it to have an effect on them. Can goofer dust be used on someone that is stalking you ? An ex is stalking me and I want to know if goofer dust can be used to stop him and make him ill ? And have you called the police? I hope so. Yes I am protected. He needs to suffer and be taught a lesson. But, what I can't lay a trick on him. I have no contact or communication with him. How is he stalking you? Hi he comes outside where I moved sometimes but if I lay down the dust I don't want to get sick or a neighbor etc. I was wondering what other ways could I bring him in contact with the dust. I don't communicate with him. If you call his name into the dust, like Miss Aida said, the Goofer Dust won't affect you or your neighbors. When working with goofer, to protect YOURSELF from harm does anyone recommend using a bit of Florida water on your hands?? Or would that mess up the work?should you use something else? You see, I'm working with goofer.. haven't opened it yet.. and I have to do it discreetly. Can I just sprinkle some in the direction she's walking? What if she's walking with others?? I only want HER affected but she's usually with this other girl. I also can't stand her friend, but the one who did me great harm was the other one, my target (hope I'm posting this in the right place). What's your advice? Again I hope I'm posting this in the right place and staying on topic.. I did the cigarette roll up spell to cause a couple to fight for a couple of days and hope to lead to a break up. I had inflammation powder, pepper, etc rolled up in their picture and wrote my petition. To finish the burn I let it burn to ashes with more powder. I did this at a park. I threw the ashes at a cross road. Putting stuff away realized what I added extra was goofer dust powder. I only asked for the couple to fight, argue, hurt one another, and separate. I don’t want to cause them illness or to die. That was never the intention. Is there anything I need to do? Or because my intentions weren’t to cause them such pain will they be okay wait or get a reading ? It’s only been 1 day since the spell and I will no longer keep the goofer dust if I am getting them mixed up like this. I think it would be a good idea to get a quick reading and see if they'll be affected by the goofer dust, I'm not really sure. Thanks Sister Jean. I’ll get a reading done about goofer dust and also get guidance on which route or spell would be best for my situation without causing sickness or death! I have been reading the forum for info and I am grateful! Am I to assume correctly that goofer dust would probably not be successful if used to dress a breakup candle (inscribed w/ names & bdays but where no personal concerns are used)? Instead should I stick with LM breakup products ? I am wondering still...can a candle inscribed w names/bdays and dusted with goofer create cross conditions/ hexing for someone or do they need to come in contact with it? Moderator Starsinthesky7 mentions using Goofer Dust on a candle here on page 1 of this topic - goofer-dust-questions-and-answers-t8761.html#p6292 though contact would probably yield better results, as Starsinthesky7 mentioned after the candle, by putting it in their path. RevJames- you always are a huge help and I am very grateful! RevJames gave you some good advice! Yes, we make and sell Goofer Dust. Thank you for pointing out that the "blue button" buy-it-now link was left off the "Hoodoo in Theory and Practice" Goofer Dust page! Nagasiva is fixing and updating that right now, even as i type this message! Again, thanks for helping us upgrade our site. Thank you, Ash1111, for pointing out that the "blue button" buy-it-now link was left off the "Hoodoo in Theory and Practice" Goofer Dust page! Nagasiva is fixing and updating that right now, even as i type this message! Again, thanks, Ash1111, for helping us upgrade our site. Thankyou and no problem for alerting you to the issue. Would you say its safe to use goofer dust as a novice due to thegraveyard dirt being in it, or would I be better off using another jinxing type powder? I have no idea what you mean about being "a novice." Maybe the word means something different to you than it does to me. As i understand and teach it, hoodoo is a form of folk magic, so there are no grades of hierarchy whereby "novices" would be offered different spells than experts or would be limited to certain "novice" techniques. 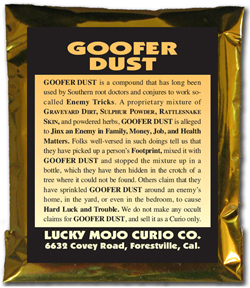 If you have personal difficulties or problems working with the spirits of the dead, then you should not use Goofer Dust. It's that simple. I skimmed through this thread and noticed someone stating not to put goofer dust on cigarettes or in anything that the target may ingest because it is toxic, but if the point of goofer dust is to seriously harm someone, then why shouldn't they ingest it? One reason people work magic rather than simply poison one another or shoot them is to bring about loss of luck, a break-up, a departure, or a death to which they themselves are not evidently connected.